For starters, what bands were you guys a part of prior to (Echo 2 Locate)? How long has the band been around? Rhiannon Neagle: The band has been around for about 2 years. Before creating the band with Mike, I was originally a solo artist but I knew I belonged in a band. Will was apart of Drop 42 and Mike was in Earthborn. We decided to use the number two instead of the word “to” to represent that me and him started the band from nothing. Just a drummer and a vocalist/rhythm guitarist trying to figure out how they could make this happen. The name though for us has come to mean when trying to find your heart or yourself and you just can’t see clearly, just listen for the sound. Clarke Hildreth: All four of us write the songs together. As the songs tend to range, it’s hard to group all of our songs together under one thing. We try to cover a lot of different themes and topics. We have songs about overcoming personal hardships, and we also have very positive and lighthearted songs as well. It’s likely that the themes and topics will evolve over time as we grow together, but we definitely want to make sure we don’t drastically change what our fans have fallen in love with. Mike Pritchett: There aren’t any specific bands however I would say the album that we are currently writing, definitely has been inspired by a lot of metal. Clarke Hildreth: We try to be unique sounding as a band, which comes naturally as all four of us have different influences that we bring to the table. The influences range from alternative rock to pop-punk, grunge, and metal. Rhiannon Neagle: Green Day’s performances have always blown me away and they always seemed like such a close family on stage and I knew after seeing them that, that’s exactly what I wanted. Clarke Hildreth: All four of us have our pre-show rituals that we do to get amped and ready. For starters, we all will message each other in the morning to get hyped the day of a show. Directly before the show, I personally will strum my guitar and jump to get the blood flowing. Rhiannon Neagle: We ALWAYS fist bump on stage before performing. Clarke Hildreth: We have been very fortunate together during the year that all four of us have been playing together. The highlights keep coming in. The biggest highlight for me is sharing the stage with a band that I heard on the radio when I was a kid. For example, we’re playing a show in April with The Red Jumpsuit Apparatus. We can’t help but be excited about the opportunities to come. Will Servary: Green Day because their live performance is absolutely AMAZING. 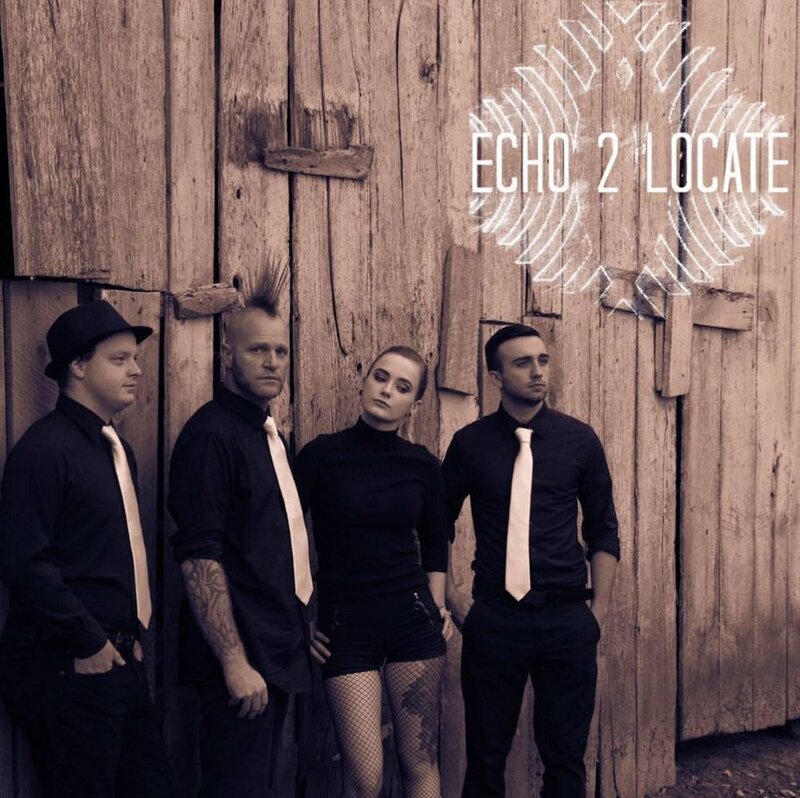 Rhiannon Neagle: Thank you so much for taking the time to check out Echo 2 Locate!